It's funny how many people comment on who Mack looks like. Here's our pics at approximately the same age. What do you think? let me have them before I die.8 First, help me never to tell a lie. Second, give me neither poverty nor riches! Give me just enough to satisfy my needs.9 For if I grow rich, I may deny you and say, "Who is the Lord ?" And if I am too poor, I may steal and thus insult God's holy name. In particular the part that says, "Give me just enough to satisfy my needs." Wow, how often are we asking God to give us enough so we don't have to worry. This guy sums it up well, check this out. Lord, I pray help me to be content with just enough to satisfy my needs. May I never be greedy for more or ungrateful for what I have but satisfied with your provision as I seek you first. This week we met at Rachel Williamson's house for our Mommy's Day Out. There were a few new ones that joined us this time - this has the potential of getting really big. I didn't realize how much this is needed. I found it interesting as I sat and listened to several mom's talk, how many different methods and preferences there are to child-rearing. I guess we all have to figure out what works for us and stick with it, I just want to be careful that I never come across as though I've got it all figured out or that there is only one way. I'm thankful for this group and look forward to learning from each of them. January 2010 welcomed the 15th class for Mission Master's Commission (It's hard to believe I came down here 9 years ago thinking I will complete my 7 months and be on my way - I'm still here). We had 5 first year's join us this semester - one is from our own youth group, another from Oklahoma, one from Kansas, one from Mississippi, and one from Guatemala. They seem to be meshing quite well. Looking forward to all God has in store for them. Little do they realize how much 7 months can change your life - it did mine! The youth group is gearing up for their first big event of the year - Life Challenge Retreat. This event is designed to be a personal-growth-oriented outing focused on building self-confidence, leadership abilities, and communication skills. During the retreat, students and leaders will work their way through a huge obstacle course, challenging problem-solving situations, and enjoy quiet God-moments, encouraging each other along the way. We've got 67 going - that's exciting! We are still going strong and really enjoying the devotional "Moments with the Savior". 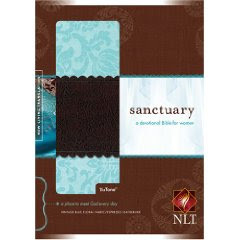 I'm still reading my Woman's Devotional Bible - Sanctuary but I've made some modifications to the reading plan. I've also enjoyed reading through the book of Proverbs with our youth group and daily posting on facebook. Wanted to update my blog at least twice a month and I've actually posted 5 times this month - yeah! I've faithfully kept a daily picture of Mack on photobucket - I really like doing this. I was able to read through 2 books this month (feeding times really help). 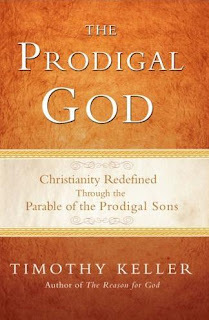 One of the books I read is called "The Prodigal God" by Timothy Keller - it breaks down the famous story in the book of Luke known as the parable of the prodigal son. A story about a son who takes his father's inheritance and wastes it all and then returns home to a forgiving father. But it is a great mistake to think this is a story about just one son. It's actually a tale of two sons. It's a story about a younger brother and an elder brother... I'll stop there so as not to give too much away but I would definitely recommend this book. "On Becoming BabyWise" by Gary Ezzo & Robert Bucknam is the other book I read. On Becoming Babywise brings hope to the tired and bewildered parents looking for an alternative to sleepless nights and fussy babies. The Babywise Parent Directed Feeding concept has enough structure to bring security and order to your baby's world, yet enough flexibility to give mom freedom to respond to any need at any time. It teaches parents how to lovingly guide their baby's day rather than be guided or enslaved to the infant's unknown needs. 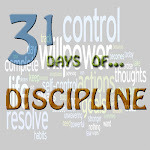 Although there has been some controversy on the methods used in this book I believe if you take it as a grain of salt and use what works for you, you can benefit from it. It may not be for everyone but it has worked for me and I would recommend at least looking into it and forming your own opinion. Myself and a group of other mom's with young children decided to have a Mommy's Day Out twice a month where we can bring our kids and have a time of fellowship. I've enjoyed the two we've had and look forward to many more. Mack is growing so fast - the other day I was sitting on the couch kissing Mack's little cheeks and talking to him when it dawned on me there will come a day (probably when he's in junior high) that it won't be "cool" anymore for mom to kiss him, Micah just laughed at me buts it's true. Mack had his 2 month check-up and is doing great! I'm so glad I get to stay at home with him, I couldn't imagine being away from him all day. I really feel for the women who have to work but want to stay at home. I know it's not for everyone but I wouldn't want it any other way. Micah is doing great - he amazes me at how well he juggles everything on his plate from being the Master's Commission director, youth pastor, intern director, husband, friend and dad... he deserves an award! We are more in love than ever and enjoy life together. 2010 has gotten off to a great start and I'm looking forward to seeing what else God has in store for this year. 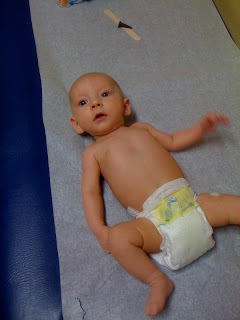 Today was Mack's 2 month check-up with is pediatrician. He is right on schedule weighing at 10 pounds 6 ounces (in the 25% bracket), 23 inches long (50% bracket), and head circumference at 15 1/4 inches (25% bracket). He had his first set of Immunizations which are designed to protect against serious illnesses ranging from polio and tetanus to measles, mumps, and the seasonal flu. Immunizations are vaccines made of either weakened or "killed" versions of the bacteria or virus that causes a particular disease. When these altered viruses and bacteria are injected or taken orally, the immune system mounts an attack that stimulates the body to produce antibodies. 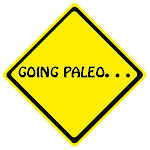 Once produced, the antibodies remain active in the body, ready to fight off the real disease. For example, if whooping cough broke out in our area, an immunized child would be much less likely to contract the disease than one who wasn't immunized. One cool thing that our Doctor uses is a numbing cream that helps the shots to not be so painful. Most offices don't provide this because insurances don't cover it but our pediatrician offers it as a complimentary service because they know how hard it can be to see your child hurting. Mack did cry but it wasn't near as bad as I thought it was going to be. Here he is at the Dr's. On January 23rd Mack officially turned 2 months old - my how time flies by! Mack amazes me each day as he continues to grow... during his wake hours he's watching, listening, absorbing and learning so much as he is becoming more adapted to his surroundings. He's now able to express pleasure in addition to discomfort, and gives frequent genuine smiles. Mack's auditory and visual senses are just beginning to coordinate. He may look toward an interesting sound and search for it with his eyes. He may even coo or gurgle in response to what he hears. He's already able to track a moving object from side to side (usually watching his daddy). Sucking is still a highly engaging activity, and Mack can now more reliably connect his hand with his mouth. He will want to put his mouth on everything--this is how he learns where his body ends and everything else begins. Feeding and sleeping have taken to a routine with Mack sleeping anywhere between 6 and 8 hours through the night. I have cherished every moment with Mack, even the cranky times. I absolutely love the adventures of motherhood - I really feel like I'm fulfilling the rest of my calling, first as a wife to Micah and then as a mother. I'm very grateful to get to stay at home with him as well, it truly is a blessing! 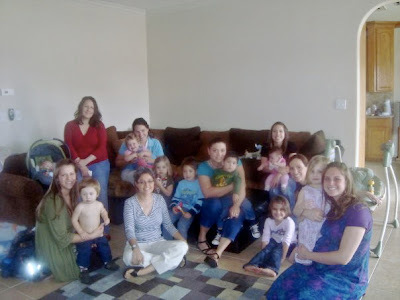 Today myself and several other girls from church got together with our little ones ranging in age from 7 weeks to 4 years old. We are all stay-at-home mom's to some degree and have been longing to have some fellowship with other's where we could also bring our children. Today we met at Chick-fil-a where the older kids could play in the kids area while we mom's could chit-chat. I think I speak for us all when I say it was much needed and we're looking forward to the next one. 1. Have daily devotions as a family. 3. Update my blog at least twice a month. 4. Read at least one book a month. It's been a little bit since I've updated you on Mack. He is now 6 weeks old and progressing right along. After his two week check up he wasn't gaining enough weight so we began supplementing formula and at 4 weeks he finally reached 8 pounds 3 ounces. At 6 weeks he's pursing his lips, raising his eyebrows, widening and squinting his eyes, and furrowing his brow. Mack holds his head pretty steady and is able to lift it when lying on his tummy. He is such a joy to watch. He's recently become acquainted with his thumb. Getting Ready for bath time. He's actually been enjoying the bath time but he looks pretty serious. Done with his bath and quite content.